With great attention paid to service and comfort, Hotel Cristina distinguishes itself as a fine, quiet and luxurious boutique hotel, ideal for island breaks and longer summer holidays. Double and twin rooms are available as standard or superior. Family rooms are ideal for two adults and two children. Most rooms have a balcony overlooking the bay; others have an inland or country view. All rooms are en-suite and equipped with an in-room safe, digital television, direct dial telephone with voicemail, hairdryer, and tea & coffee making facilities. The hotel runs a 24 hour room service. The spectacular views are best enjoyed from the lovely Indigo Restaurant’s dining room and in the summer from the beautiful terrace. Individual spaces have been created there to provide privacy and a warm intimate environment for guests. Offers à la carte and seasonal menus – Genuine Jersey produce is always favoured. Light snacks and drinks are available all day long. The Cristina is not suitable for people with limited mobility. 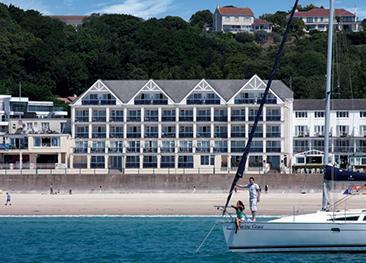 The Hotel Cristina is tucked away at the top of a winding road offering spectacular sea views over St Aubin’s bay. The bay stretches from St Helier to St Aubin’s harbour and is only 10 minutes’ walk or a couple of minutes’ drive away from the hotel. This central location is ideal for anything from exploring to shopping. Excellent hotel. 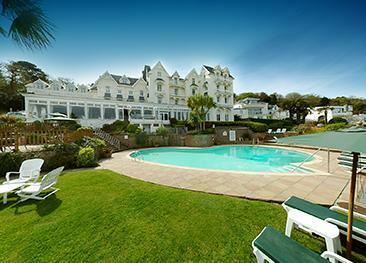 They coped superbly for a group holiday with rooms, meals and comfort. Well run hotel with good refurbished room in the main house. Friendly staff were particularly good. The hotel details should say that it is 200ft above sea level and foot access to the hotel is up a steep slope and 50 or so steps, and there is no lift for those on the 1st and 2nd floors. Brilliant stay at a very friendly hotel.Everything about the Cristina was first class. Excellent food in restaurant. Very obliging staff-helped my wife who has mobility problem. Hotel a bit tired, but clean. Not knowing anything about Jersey previously, found it not near enough any resort, had to use car all the time, would like to have been able to walk more . Very well organised hotel with friendly staff.